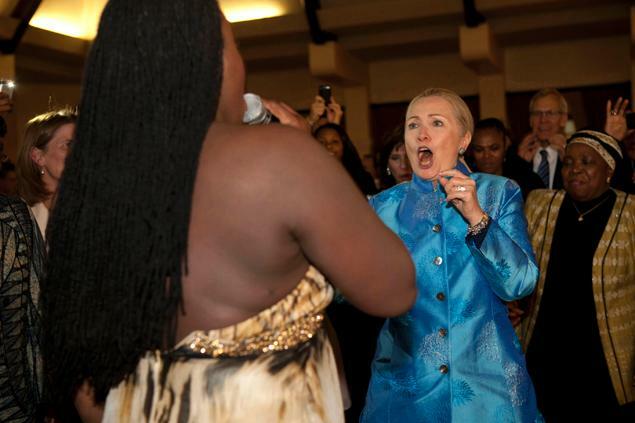 The United States Secretary of State is shown in the video below dancing the night away at a party in South Africa. The party hosted by South African Foreign minister Maite Nkoana-Mashabane. took place Tuesday night and at a point during the proceedings, a jazz singer performing moved over and began grinding her behind into Hillary Clinton’s crotch. Clinton, of course, wouldn’t be the world’s most powerful woman if she didn’t give as good as she got! Happy moments at least they are not terrorists! That is the world will are looking forward to where we all live together and dance together irrespective of class or race.